The birth and early years of the Mineralogical Society of America have been summarized by Professor E. H. Kraus, in two short papers, "The Future of Mineralogy in America" (Kraus, 1921), and "The First Ten Years of the Mineralogical Society of America" (Kraus, 1930). The present paper documents Dean Kraus' brief historical accounts; it attempts to explore some of the problems encountered, and some of the underlying differences of opinion out of which the Society grew. The element of controversy, an essential ingredient in the evolution of any society, is necessarily omitted from presidential addresses where the accent is on unity. The hope is that this account, however incomplete, will lead to a fuller appreciation of the vital role played by the Society's Honorary Life President in getting the MSA underway -- a role which is characteristically understated in the Dean's two papers. The Archivist has drawn heavily upon the correspondence files covering the interval 1916-1926. He is indebted to the Secretary of the Society, Professor R. J. Holmes, for searching the files and making available pertinent papers. As noted by Kraus the stimulus for the formation of a mineralogical society was the general dissatisfaction of mineralogists with the program of the annual meetings of the Geological Society of America. The feeling was that the meetings were enjoyable socially, but of little profit mineralogically. An additional impetus grew out of the lack of a suitable publication outlet for mineralogical papers. Many mineralogists of that day felt constrained to send their work abroad for publication. In spite of the widespread disenchantment with the status accorded mineralogists by the GSA, the reaction was lukewarm when in 1913 Professor A. N. Winchell of the University of Wisconsin sent out letters to some twenty mineralogists proposing the establishment of an independent National Association of Mineralogists and Petrographers. Apparently the mineralogists, while recognizing the shortcomings of the status quo, were unwilling to divorce themselves completely from the influence and prestige of the GSA. The results of the poll led to a decision to postpone action in order to allow time "for the then relatively new plan of sectional meetings of the GSA to be tested out." In making this decision Winchell stated that he had been particularly influenced by a letter from Professor L. V. Pirsson. When after three years the idea of a sectional mineralogical meeting of the GSA had failed to take root, Kraus and five other eminent mineralogists got together at the GSA meetings at Albany, New York, in 1916 and revived the concept of an independent mineralogical society. In effect the birth of the MSA dates from this meeting, although the organizational meeting was still three years away. The six principals involved are to be considered the Society's founding fathers. The six represented in a purely unofficial way a wide spectrum of mineralogical interests. E. H. Kraus of Michigan, A. H. Phillips of Princeton, and F. R. Van Horn of Case School of Applied Science represented the nation's universities, T. L. Walker of the University of Toronto, and the Royal Ontario Museum of Mineralogy, Ottawa - Canadian Universities, Walker and H. P. Whitlock of the American Museum of Natural History, New York - museums, and E. T. Wherry who had recently transferred from the Smithsonian to the Bureau of Chemistry of the Department of Agriculture government research and "The American Mineralogist." As an outcome of this conference, the following circular written by Dean Kraus, but undersigned by all six, was sent out to 51 mineralogists in this country and Canada early in 1917. Ann Arbor, Mich., February 5, 1917. "For several years past, some of those attending the annual meetings of the Geological Society of America have discussed the advisability of organizing a separate society composed of persons whose interests lie more especially in the field of Mineralogy. The feeling has been growing that the founding of a Mineralogical Society would do much to stimulate greater interest in the subject and also give wider recognition to the work being done in this field in America. Accordingly, the undersigned, who were in attendance upon the meetings of the Geological Society of America, at Albany, in December, 1916, discussed this question very thoroughly, and it was agreed that the time has come when an organization which might be called "The Mineralogical Society of America" should be formed at as early a date as possible. While many of the advantages resulting from such an organization are apparent to all interested, the undersigned felt that perhaps the greatest benefit to be derived would be the founding by the society of a journal to be devoted exclusively to the publishing of mineralogical papers. As is well known, there is great need for a dignified medium of publication for the increasing volume of mineralogical investigations which are being carried on in America. Naturally such a publication must be started on a modest basis, and appear perhaps at first as a quarterly. Members of the society would of course receive the journal free of charge. With respect to organization and means of publication, mineralogists in America are far behind their colleagues in Europe, but we feel confident that you will respond promptly and favorably to our appeal to unite with us as a charter member in perfecting the organization of this society, the standards of which are to be on a par with those of the Geological Society of America. In order to insure the publication of a journal, which would naturally have a somewhat limited circulation, it was thought advisable that the annual clues be placed at $10.00. This letter is being addressed to a selected list of mineralogists in the United States and Canada, and if a sufficient number of favorable replies is received, it is planned to complete the organization sometime during the current year. Professor Edward H. Kraus, Ann Arbor, Michigan, has been designated to conduct the correspondence looking toward the organization of the society. He will be glad to hear from you at your earliest convenience. Alexander H. Phillips, Thomas L. Walker, Herbert P. Whitlock. The results of the poll were summarized by Kraus in the following memorandum. Ann Arbor, Michigan October 12, 1917. Of the 35 replies received, 29 were favorable. Two others must be considered as doubtful for the present but in all probability could be counted upon if the society is organized. To these 29 favorable replies, there must, of course, be added the six names which appeared on the circular letter, so that about 35 are at this time in favor of the organization. This number could undoubtedly be increased to about 40 if it is definitely decided to proceed with the formation of the society. On account of the very unsettled conditions at present, it has been thought wise to hold the whole matter in abeyance, but to urge those who receive this letter to attend, if possible, the meetings of the Geological Society of America, which will be held in St. Louis in December. At that time all interested can get together for further discussion, and perhaps preliminary organization. This letter is being mailed to those who look with favor upon the organization of the Society. Although the bulk of the returns was unquestionably affirmative Dean Kraus' simplified box score doesn't tell the whole story. A few voted affirmatively but indicated they themselves would be unable to join; a typical reply cited rising prices including those of "potatoes at $2.60 a bushel and dog meat at 200 a pound" as the main problem. Professor William E. Ford noted the small number of mineralogists available for the new society to draw upon and brought up once again the old question of a mineralogical section within the GSA. However, he added he could be wrong and said he was quite willing to join a mineralogical society and do his share in making it a success. For the present he felt no need of a journal since the American Journal of Science adequately filled the bill for Yale. Professor Albert Johannsen said he would prefer a combined Petrographical and Mineralogical Society. He said he was not enough of a mineralogist to belong to an exclusively mineralogical society. Upon Kraus' assurance that the signers of the circular did not take a narrow view of mineralogy but rather intended to include petrology Johannsen changed his vote to yes. Those voting an outright no made up in prestige what they lacked in number. Some of these individuals were to have second thoughts over the next four years and become charter fellows. Professor J. P. Iddings and Professor L. C. Graton noted that there were already too many societies. After enumerating the organizations to which he belonged Graton added "I would hesitate, however, to drop membership in any of these organizations, but would doubly hesitate to encourage the formation of still another society." He pointed out that if the proliferation of specialized societies continued "the Geological Society of America would be so cut into slices that the parent organization itself would be weakened and gradually fall to pieces." Among the dissenters were three distinguished members of the Geophysical Laboratory, Arthur L. Day, Director; Herbert E. Merwin; and Frederick E. Wright. Dr. Day in whose honor the GSA was later to name one of its most coveted medals remained a holdout to the last. He considered that he "spoke for the majority of the Laboratory" when he said "the Laboratory as a whole felt no need of such a society" and had encountered no publication problems with the existing journals. Dr. Merwin noted that the number of specialized mineralogists was by itself too small to support a society and voiced a petrologist's point of view when he stated " . . . outside of the 'natural history' side the interest (in minerals) is largely due to geological, chemical, or physical applications which are made of mineralogical data." He added in closing, "There are so many men who use mineralogical data who would not wish to subscribe for a periodical given exclusively to mineralogy, that I favor publishing mineralogical papers in periodicals which already have a wide circulation." Always one to take his professional obligations seriously, Dr. Merwin in spite of his misgivings joined the new Society and was honored by election to the presidency in 1930, and by the award of the Roebling Medal in 1949. As in many other ways Dr. H. S. Washington was the exception among his colleagues at the Geophysical Laboratory; he endorsed the whole idea enthusiastically from the start. His ability to come up with papers that were both amusing and informative (e.g. the "Jades of Middle America") with very little notice was to be the salvation of the Society's annual meetings during its early unsettled years. He gave himself the title of "Old faithful" and said he was always on tap "with a story to quiet the children." The disaffection of Dr. Wright, who was held in high regard for having introduced the methods of modern optical mineralogy into this country from Germany, came as a particular blow to Kraus. Wright stated that he would not join such a society unless its name was changed to "The Crystallographic Society of America." He gave as his reason the fact that "crystallography is a much broader subject than mineralogy and if we look upon crystallography as the science which has to deal with matter in the crystal state then crystallography is on a par with physics and chemistry." This viewpoint of Wright's contrasted with that of G. F. Kunz who held that crystallography was merely a "subdivision of determinative mineralogy." Wright pointed out that "there was much more reason and much more chance for success to start a Crystallographic Society of America in view of the complete lack of publication outlets for papers on that subject." Another dissenter Professor A. C. Gill of Cornell agreed with Wright. He felt that the "crystallographic part was highly desirable" and cited the lack of publication media. He went on to say, "I am one who thinks we need a mineralogical society as much as a cat needs three tails.... If a subdivision must be made into sheep and goats, classify me with the goats." Admittedly with an eye towards bringing Wright back into the fold, Kraus in referring to the proposed society over the next two years was to attempt a compromise by changing its title to "The Crystallographical and Mineralogical Society of America." The change of title was advocated also by Wherry who had recently transferred to the Bureau of Chemistry and was then concerned with the crystallographic and optical properties of alkaloids and organic compounds. The preliminary constitution brought up for consideration at the organizational meeting gave the name of the proposed society as "The Crystallographical and Mineralogical Society of America." Apparently the name was rejected as too cumbersome by Kraus' confreres; instead the high status to be accorded crystallography was clearly spelled out in the preamble to the provisional constitution which defined the object of the society as the "advancement of mineralogy, crystallography, and the allied sciences." In a master stroke of diplomacy Wright was thereupon elected a Councilor of the new society. The constitution as formulated provided for several classes of membership: (1) fellows, who were to be nominated by the council; the requirement, published results of research, (2) members, all others engaged in, or interested in mineralogy, crystallography or the allied sciences, (3) patrons who shall have conferred material favors upon the Society and (4) correspondents, or residents outside of North America who are sufficiently distinguished in the subjects for which the Society stands to warrant their receiving this recognition. Because the number attending the organizational meeting was relatively small the designation "Charter Fellow" and "Charter Member" was extended to include all those whose applications were accepted by the Society up to the end of 1921. The goal of total membership of combined fellows and members for the close of 1920 was initially set at 350 to 400. This goal proved unduly optimistic and was not reached for almost 10 years. By the end of its organizational year Kraus reported that the Society had 48 charter fellows and 125 charter members, an altogether respectable figure. The Society's files recorded the names of 68 fellows by the end of the charter period. The six individuals whose efforts had sparked the formation of the MSA were elected officers or councilors. Dean Kraus was elected President, T. L. Walker-Vice President, H. P. Whitlock-Secretary, E. T. Wherry-Editor, and F. R. Von Horn and A. H. Phillips-Councilors. In addition A. B. Peck of the Bureau of Standards, Washington, was elected Treasurer, and A. S. Eakle of the University of California, and F. E. Wright of the Geophysical Laboratory were elected Councilors. Shortly thereafter Peck rejoined the faculty at Ann Arbor, a move that inevitably prompted postcripts in letters to Kraus of the general type "regards to Hunt and Peck." Although the question of affiliation with the GSA had been pointedly ignored in Kraus' original circular, the results, like those of Winchell's earlier poll, indicated widespread preference for some sort of alliance with the GSA. From that point on the question was no longer "whether" to affiliate but rather "how" to do so to the best advantage. The prospect of the new society filling a subservient position to the GSA as a section within the larger body had lost its charms. The decision was to push for an independent, but cooperative, role within which the society was free to publish its own journal. At the organizational meeting the assembled group passed a resolution supporting affiliation with the GSA while at the same time laying down certain general conditions to be satisfied. The newly formed MSA council appointed a committee of three, E. H. Kraus, E. T. Wherry and H. P. Whitlock to negotiate the terms of affiliation with an appropriate committee chosen by the GSA council. The GSA committee was made up of the Secretary of the Society, E. O. Hovey, together with I. C. White, E. B. Mathews, E. W. Shaw, R. A. Daly, David White, and J. C. Merriam. After a preliminary meeting of the MSA delegates at the Commodore Hotel to solidify plans the two committees convened in Dr. Hovey's office. The new society was not inclined to approach the older organization with hat in hand. As Wherry wrote Whitlock "the resolution states exactly what we felt, namely that if the GSA wishes us to affiliate, they would have to do something for us. They pay $3.00 into a publication fund for every member of the Paleontological Society, although it is true that this fund is used not for a separate journal, but for a mere section of the Bulletin of the Geologic Society devoted to paleontologic papers.... it seemed to us that it was not unreasonable to ask that they do the same for us. Then a present fellow of the GSA could belong to both GSA and MSA for $12.00 of which amount the GSA would keep $7.00 (the amount they now keep for each paleontologist) and the MSA (would get $5.00.. . we would gain members because geologists would not hesitate about joining us if they had to pay only $2.00 in addition to their $10.00...."
The plan had merit all around. It guaranteed the independence of action of the MSA while providing financial benefits to it. At the same time it effectively forestalled any mass exodus of fellows from the GSA while providing a pool of fellows upon which the new society might draw. The combined dues for fellows in the separate organizations were set so low as to provide an irresistible bargain to all interested parties. The GSA was relieved of the expense of publishing mineralogical papers, and in return agreed to underwrite part of the costs of the new mineralogical journal; the basis for the transfer of funds was to be the number of dues paying fellows common to the two societies. The plan provided that the president of the new society would automatically become fourth vice president of the GSA and a member of its council thereby insuring representation on the policy-making board of that organization. Above all the plan prevented the fragmentation of the GSA about which Graton and others had warned. These arrangements were approved in sequence by the special committee of the GSA, by the GSA Council and by the GSA membership. On December 1, 1920 Dr. Hovey notified the Secretary of the MSA that the amendment to the Constitution of the GSA providing for the close affiliation of the MSA had been adopted and that he was placing the name of Charles Palache on the GSA ballot for fourth vice president in accord ance therewith. At the organizational meeting those present voted overwhelmingly to take over The American Mineralogist as the official journal of the new society. This action was a strong vote of confidence in Wherry who was widely respected by the mineralogical fraternity. Earlier A. N. Winchell had written Kraus in reply to the original circular that he favored taking over The American Mineralogist "because the journal has pursued a very modest but dignified policy and has maintained a high standard." "It was decided to publish a journal devoted to mineralogy, crystallography and the allied sciences which shall be the official organ of the society, and which the general membership of the society shall be entitled to receive. The present plan is to enlarge The American Mineralogist to include research papers and abstracts, but at the same time to retain the valuable features of this publication which has become recognized as of permanent interest to such collectors and amateurs who are eligible for membership but not fellowship." Your letter and enclosures were duly received. The note for Science was very satisfactory and in particular the former owners of The American Mineralogist will be pleased to see your kind reference to it. In the previous article (announcing that the formation of the society would take place December 30.,) Kraus had inadvertently written something concerning the new society and its magazine which sounded as if The American Mineralogist was to be ignored, and Trudell in particular felt somewhat disconcerted about it; but this will square matters. Unfortunately for The American Mineralogist the change in sponsorship effected no immediate miracles. The lean years continued. Not only did the publication suffer from a lack of funds but with the change in emphasis to results of research new problems arose. Some authors were hesitant about entrusting their original work to a journal of limited bulk and limited circulation. The editors time and again were placed in the unseemly position of having to broadcast pleas for papers. 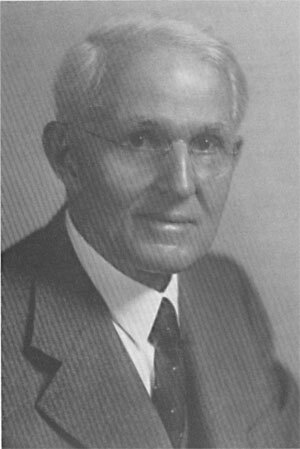 Dr. Wherry, whose work on organic materials and artificial compounds had been leading him inevitably away from mineralogy and towards botany, resigned as editor in 1922 and served as the fourth president of the MSA in 1923. Thereafter he left the field of mineralogy as an active practitioner but maintains to this day a lively interest in the subject. He was succeeded as editor by Professor W. F. Hunt, a charter fellow, and colleague of Kraus at Ann Arbor. Hunt was to serve in that capacity for 35 years. When Hunt terminated his long editorship, the Society in 1957 in recognition of his devotion bestowed its highest award upon him, the Roebling Medal. Under Hunt in 1925 The American Mineralogist produced the first two of its special numbers, each of which described the research of a single institution. The University of Michigan sponsored one, and Harvard University the other. The results were in each case markedly successful. They did much to educate research workers to the advantages of publication in the journal, and in addition demonstrated how much could be accomplished given adequate financial backing. Among others who were impressed by the special numbers was Col. Washington A. Roebling, designer and builder, along with his father, of that engineering wonder of the time, the Brooklyn Bridge, and owner of one of the finest private mineral collections in the nation. Previously Col. Roebling had on at least two occasions donated funds that had helped "bail out" the old American Mineralogist and the new Mineralogical Society when financial problems had become unduly pressing. He was one of the first to become a Life Member of the MSA in recognition of which the Society had awarded him a specially designed scroll. I would be interested to know what you think of the plan which The American Mineralogist has adopted during the past year of publishing numbers of extra size financed by the aid of the institution furnishing the material. Personally it seems to me an excellent plan. I look forward, however, to the time when the Mineralogist shall be sufficiently endowed to be able to publish such papers without the author or his institution having to bear the charges. I can think of no means of furthering the science of mineralogy in this country more efficiently than the establishment of a publication fund with an income sufficient to do this. I know that you have helped the Society and the Mineralogist in the past but would invite your earnest consideration of this suggestion for a movement to secure a permanent fund which should be ultimately not less than $50,000. Palache described the outcome of the correspondence, "Col. Roebling did not reply to my letter but within a few days he transferred to the Treasurer of the Society bonds representing the large gift ($45,000) .. . which was accompanied by the following brief and modest note. 'This gift is unconditional. I wish, however, that the whole or part of it, be devoted to the publication of the monthly magazine, The American Mineralogist, which has been conducted on too narrow a margin'." Dean Kraus writes that he "and Van Horn accompanied (the treasurer) Phillips on this historic mission" to Col. Roebling's office in Trenton. In the aftermath of his generous gift Col. Roebling was overwhelmed by expressions of gratitude from mineralogists throughout the country. The rigours of advancing years prevented his acknowledging the letters individually. Instead he sent the following handwritten note to the Editor. Few more poignant tributes to the rewards of mineral collecting have ever been written. I have received so many congratulatory letters regarding my gift to the Min. Society that I can not thank all individually. If you can find space for the following few lines I will be most obliged. Col. Roebling desires to express his thanks for the grateful appreciation of his gift to the Min. Society from all over the country and Canada. He is pleased that it has been his privilege to contribute to the advancement of this science - a science which is the gateway to the ultimate constitution of matter. I am now 89 y. of age - while I have not been a contributor to mineralogical literature (my time being taken up by engineering and business calls) I yet had a fair education in Mineralogy at the R.P.I. in Troy, N.Y. in 1856. Was quite expert in blow piping and the simpler acid beads. The professor of mineralogy - Dr. Elderhorst, (himself a pupil of WÃ¶hler) was my roommate. The old standards of chemistry were still in vogue then, and the optical properties of minerals were barely noticed. When you acquire a love for minerals the hobby lasts a lifetime - During an extended period of illness I found them my only solace. My collection has grown until it numbers over 16,000 specimens - embracing particularly all the rare minerals in which I specialize, and a fair number of large show specimens. Having lost the use of my left eye I have to write so fine. In keeping with Roebling's expressed desire the MSA has, over the years, devoted the income from the gift to the improvement of The American Mineralogist. During the first year that the additional income was available the number of pages per volume nearly doubled over that of the preceding year. In a real sense it remains a living memorial. As long as the Mineralogical Society of America exists, the gift will continue to be an invaluable stimulus to mineralogy and mineralogists. Col. Roebling could have no more fitting a monument to his generosity. KRAUS, E. H. (1921) The future of mineralogy in America. Amer. Mineral. 6,23-34. ____________ (1930) The first ten years of the Mineralogical Society of America. Amer. Mineral. 15, 98-103. 1 Archivist, Mineralogical Society of America. * Attended but did not join.